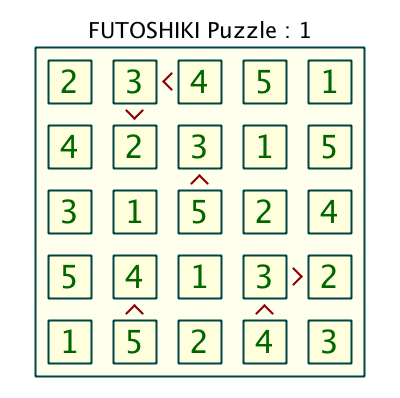 FUTOSHIKI puzzles are built on square grids of typically 5x5 cells (although puzzles having sizes in the range 4x4 up to 8x8 can also be made). To solve them you must place numbers into the puzzle cells in such a way that each row and column contains each of the digits less than the size of the puzzle. In this respect they are similar to Sudoku puzzles. To give the solver a start, there will normally be several numbers already in the puzzle. In addition, a few pairs of adjacent cells will have < and > symbols inserted between them to indicate the relative sizes of the numbers within those cells. 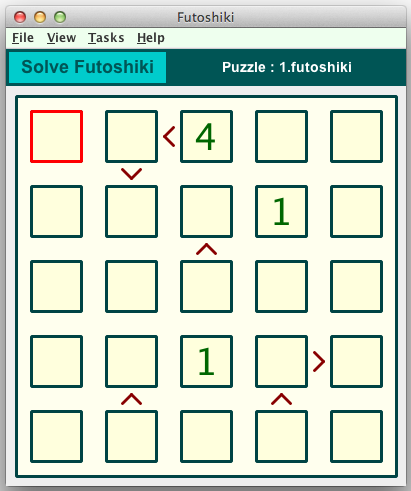 The following graphics show a Futoshiki puzzle in the Crossword Express Solve screen and a PNG graphic file produced by the program's print function, showing the complete puzzle solution. See also a full size version of a PDF file showing the solution. Fully automatic construction of puzzles in sizes from 4x4 up to 9x9. Three levels of difficulty are available, as well as control of the number of initial digits.